When it’s my turn to cook dinner – and that would be most every night! – I often don’t feel like spending a lot of time planning or cooking. So I understand if you feel the same. This recipe has just three main ingredients, which helps me get cooking simply on a tired night. Chicken, tomatoes and garbanzo beans. The remaining ingredients most likely are part of your pantry staples: paprika, cumin, red pepper, garlic. If you don’t have fresh tomatoes, a can of lightly drained diced tomatoes is a fine substitute. I like to serve the dish with plain yogurt, and if you’re a fan of cilantro, add a handful of chopped fresh leaves if you have some. Heat oil in a large skillet over medium-high heat. Add chicken, seasoned side down; sprinkle remaining seasoning over chicken. Cook 4 minutes on each side or until well-browned. Move chicken to side of pan. Add tomatoes and garlic to pan. Cook on medium-high heat, breaking some of the tomatoes to release juices. Add garbanzo beans. Cover and cook 2-3 minutes or until internal temperature is 170ºF and mixture becomes slightly saucy. Combine yogurt and cilantro (if using), and serve with chicken. Paprika is made from ground peppers and can be spicy or mild depending on the type of peppers. Smoked paprika (pimenton) is popular in Mediterranean dishes and is made with peppers that have been dried over an oak fire. This adds a smokey-rich, somewhat bacony flavor without extra heat. An original recipe by Rosemary Mark for Harvestland Chicken. Rosie, this looks yummy! I am hooked on smoked paprika! 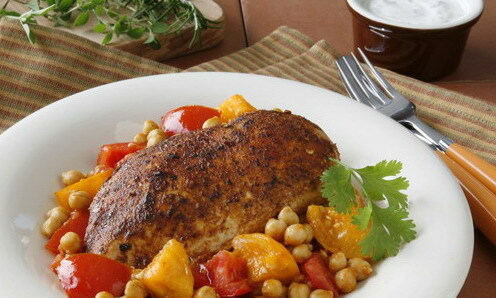 The Mediterranean Spiced Chicken sounds heavenly and refreshingly different. I think that cumin is an under used spice in our culture. Thank you! Glad you like cumin, Audra! Do you have favorite recipes you make with cumin? This is my kind of recipe! Interesting flavors, yet super easy. I’ll let you know when I try it. Thanks Rosie. Love this one…first time made it with thighs instead of breasts, and the extra fat from the skin gave the beans this awesome crispiness; made it a second time with the breasts, and equally delicious! Thanks Rosemary!